Two weeks into the 2009 NFL season a few things are evident. Tom Brady still needs to shake off a little rust after being inured last year. Peyton Manning is still Peyton Manning, just nearing the end of his career. Tony Romo still can’t win the big game, and Ben Roethlisberger can pump fake while taking a hit. But none of them are Drew Brees. 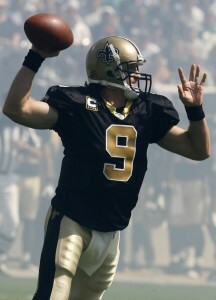 In week two against a much stronger Philadelphia Eagles defense, Brees only threw for 311 yards and 3 touchdowns. The Saints quarterback has thrown for a combined nine touchdowns in the first two weeks of the season, enough to tie the record for most touchdown passes in the first two weeks set by Charley Johnson of the St. Louis Cardinals in 1965. .Ask any Saints fan and they’ll tell you that they’ve seen this coming since 2006, when the Saints signed Brees as a free agent from San Diego after the Chargers deemed him expendable after tearing his labrum in the final regular season game of 2005. Since 2006 Brees has completed more passes, thrown for more yards, touchdowns, 25+ yard completions and 300 yard games on top of completing more passes for first downs than anyone else in the league. He also came within one completion last year of setting the single season record for passing yards and for his efforts became only the second quarterback in NFL history next to Dan Marino to throw for over 5,000 yards. He is the lifeblood of the Saints offense, according to head coach Sean Payton, and his savvy play makes everyone on the field around him better. Not too shabby for a guy whom many “experts” hadn’t even ranked in their top five quarterbacks, until now.